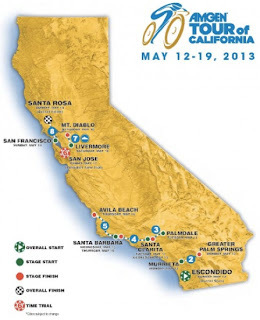 The route for the 2013 Amgen Tour of California is about to be announced (see info on the route below ...). You can watch the Press Conference LIVE in just a few minutes at 1:00pm PST (California time) at this link: [COMPLETE] Watch Tour of California Route Announcement Live. I'm excited for this year's race. Setting a good route for 2013 is important for the health of the race and to keep it's place as the #1 stage race in America - "America's Greatest Race". I will be there, for sure. The 8-day stage route runs from south to north this year and has a mountain top finish on Mt Diablo! (The last 100 meters are 17% grade). Finally finishing in Santa Rosa where a nice local glass of Sonoma County grown wine will be well-deserved. How brilliant to flip the direction of the race. I love it, the mountains included are great, and Santa Barbara is back on the schedule. Fantastic news for the fans for one of the most beautiful cities in California to again be included in the race. I have missed Santa Barbara's inclusion, I am sad not to see Solvang as the host of the ITT (the town will always be my favorite) but San Jose has earned the right. The community of San Jose has been a host city every year since the beginning of the Tour of California and has the ability to be impressively organized. Huge news - the 2013 Tour of California is going across the Golden Gate Bridge again! Last year Pedal Dancer had a crew at the race, read more at: 2012 AMGEN TOUR OF CALIFORNIA. We'll be back in 2013, see you at the race in May! Comments: They should have filled the seats (or had no seats) at the press conference today to make it appear like it was well attended, because it was not, which was not a good sign. Although a very good sign is that the stage-race includes the major biking counties of San Diego, Santa Barbara and Sonoma. I say - take the race to the cycling fans! With this route, the organizers of the Tour of California have done just that! This is a route where we can ride our bikes to the race! Is it a good route? There are climbs in them hills! This year's route includes the cycling communities of San Diego, Santa Barbara, and Sonoma counties, there is no reason why the first stages could not include some punchy climbs, especially if they are placed early in the stages and early in the tour. "Show up ready to race on day 1" is what the ATOC needs. I remember last year gave us a solo breakaway into Big Bear which actually held - that was excitement. And the look of pain on the rider's faces up Mt Baldy - that was real. Take this race back to the small cities (give them a break on the price), to the beautiful roads, to the cyclists/fans who like to ride to a stage, to the people who stroll through the expo area, to the GC who must race from day one - and this race will be one worth watching and attending. I don't need epic, I want good racing. I also don't need it to be hyped as anything other than what it is - the best stage race America has to offer. And please - give the sponsors more exposure, in these rocky days of cycling, if money still talks, we need to show up and listen. Note: The Tour of Romandie is April 22-28, 2013 in Switzerland. The Giro d'Italia runs from May 4-26, 2013 in Italy (thus riders in the Giro will not be at ATOC). The Criterium du Dauphine takes place June 2-9, 2013 in France.